In Java, you can declare an array of arrays known as multidimensional array. 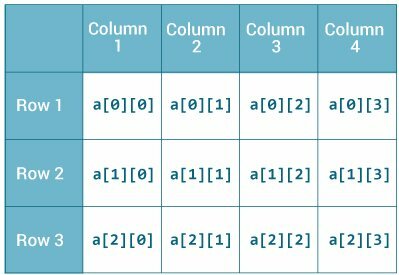 Before learning multidimensional array, visit Java array article to learn about one-dimensional array. Here, a is a two-dimensional (2d) array. The array can hold maximum of 12 elements of type int. Remember, Java uses zero-based indexing, that is, indexing of arrays in Java starts with 0 and not 1. Here, personalInfo is a 3d array that can hold maximum of 24 (3*4*2) elements of type String. In Java, components of a multidimensional array are also arrays. If you know C/C++, you may feel like, multidimensional arrays in Java and C/C++ works in similar way. Well, it doesn't. In Java, rows can vary in length. You will see the difference during initialization. How to initialize a 2d array in Java? Here's an example to initialize a 2d array in Java. As mentioned, each component of array a is an array in itself, and length of each rows is also different. Let's write a program to prove it. 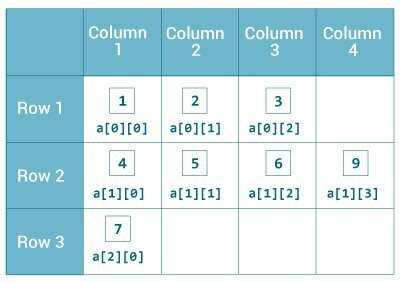 Since each component of a multidimensional array is also an array (a, a and a are also arrays), you can use length attribute to find the length of each rows. How to initialize a 3d array in Java? Basically, 3d array is an array of 2d arrays. Similar like 2d arrays, rows of 3d arrays can vary in length.